Mjolnir, the hammer of Thor, Excalibur, Aladdin's lamp, The picture of Dorian Gray. You know they're out there. Items of power, both legendary and forgotten, forged by the same mythology and fiction that spawned the recursions in which they await discovery. What would you do with a lich's phylactery, the ring of Odin, a vorpal sword, or the spellbook of Thoth? What would Earth's enemies do with these powerful, mythic items if they were brought into our world? More than 400 new cypers. More than 250 new artifacts. 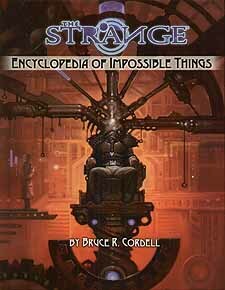 Scores of artifacts made famous by the mythology and fiction that gave life to their recursions, plus dozens of emergent artifacts that were created or evolved within the Shoals of Earth or the Strange itself. Rules for personal recursions for player characters, including a sheet you can use to design and maintain your very own recursion.